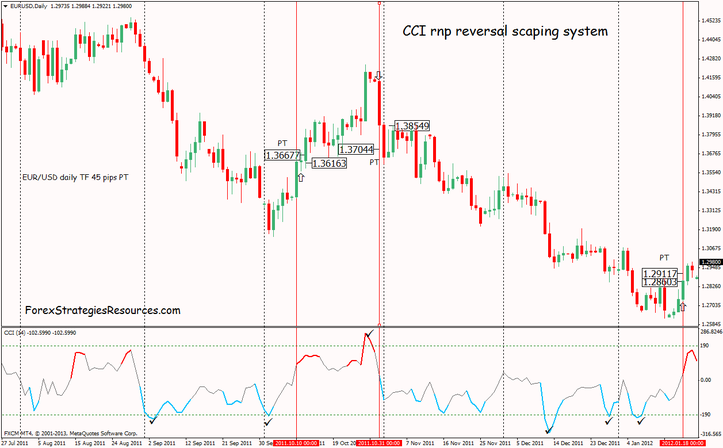 This Scalping System is a reversal forex strategy based on the CCI rnp indicator . The main feature of this Forex Strategy is the fast profit. But this system works good on all time frame. 2) buy the first buy signal the CCI rnp indicator (when it turns red). 2) sell the first sell signal the CCI rnp indicator (when it turns aqua). Time Frame 15 min: AUD/USD 8 pips, EUR/USD 10 pips, GBP/USD 12pips, GPB/GPY 14 pips, USD/CHF 8 pips, EUR/CHF 7 pips. Time Frame 30 min: AUD/USD 12 pips, EUR/USD 14 pips, GBP/USD 16 pips, GPB/GPY 18 pips, USD/CHF 12 pips, EUR/CHF 10 pips. 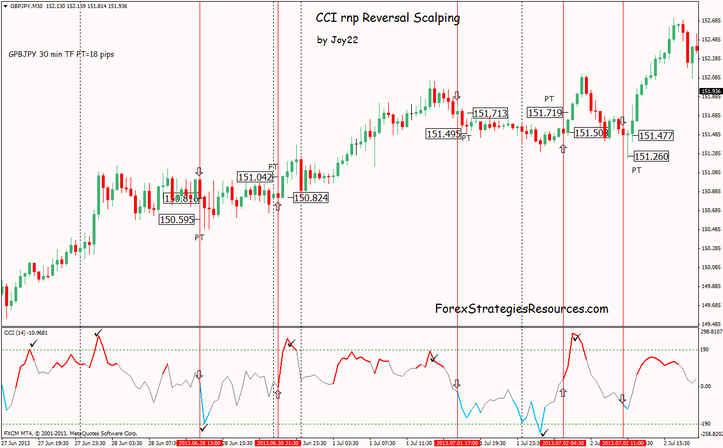 Time Frame 60 min: AUD/USD 15 pips, EUR/USD 16 pips, GBP/USD 18 pips, GPB/GPY 22 pips, USD/CHF 15 pips, EUR/CHF 12 pips. Time Frame 240 min: AUD/USD 18 pips, EUR/USD 20 pips, GBP/USD 22 pips, GPB/GPY 25 pips, USD/CHF 18 pips, EUR/CHF 14 pips. Time Frame daily: AUD/USD 40 pips, EUR/USD 45 pips, GBP/USD 50 pips, GPB/GPY 60 pips, USD/CHF 40 pips, EUR/CHF 25 pips. Place Stop loss 5-12 pips above or below the entry point. This Forex Strategy have a great profitability. This ia an other secret revelead. P.s. This Forex Strategy is also good for trading on the Binary options One touch. In the pictures below CCI rnp reversal scaping system in action. example GBP / GPY 30 min time frame, with 18 pips TP 5 trades win. example EUR / USD daily time frame, with 45 pips TP 3 trades win.